1 Describe the picture. 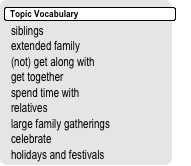 Use the topic vocabulary to help you. 1. What do you see in the photograph? 2. What do you think happened? 3. How useful do you think dogs are in this kind of situation? 5. What would you do and how would you feel if you were faced with an emergency situation? 1. Would you be interested in taking a course teaching life-saving skills? 2. What do you think you would learn in such a course? 3. What kinds of natural disasters are most common in your country? 4. What kinds of man-made disasters are common? In the photograph, we can see several rescue workers with dogs. A building seems to have been badly damaged – possibly by an earthquake or maybe by a terrorist bomb. The rescue workers might use the dogs to help find survivors. These rescue dogs get special training – they use their sense of smell and hearing to find survivors who are trapped under the destroyed building. It’s possible the dogs will find survivors and then the rescue workers will have to find a way to reach them and get them out. I’m not sure what I’d do if I were faced with an emergency situation – I’d probably be terrified! 1. Who are the people and what is their relationship to each other? 3. Where do you think they are going? 4. How might travelling by car affect their journey? 5. Would you enjoy travelling with friends? 2 Ask and answer the following questions. 1. Have you ever travelled to a new place? 2. Where did you go and who did you go with? 3. How long did you stay there? 4. What did you do while you were there? 5. Was it a positive or negative experience? Explain. This is a photograph of a group of friends. They could be two couples or just four friends.They have got luggage and are about to get into a car so I guess they’re going on a trip somewhere together. It’s hard to say what their destination is. Perhaps they are going abroad – but they might also be taking a trip in their own country. Travelling by car can make a big difference to a trip. For a start, you can be a lot more spontaneous because you don’t have to make reservations on buses and trains. Also, it’s easier to get to more remote destinations with a car. I think I’d really enjoy travelling this way with a group of friends. What is their relationship to each other? What do you notice about the ages of the people? What do you think the occasion is? Do you enjoy large family celebrations? What kind of relationship have you got with your parents / siblings? 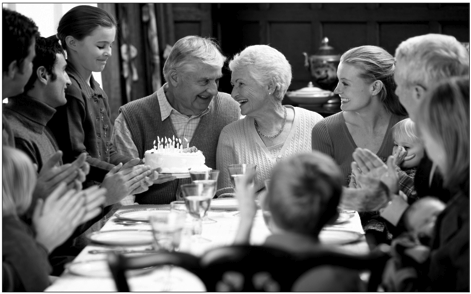 On what occasions do you get together with your extended family? How far away do they live? Do you want to live close to your family when you leave home? Why? / Why not? In this picture, we can see a group of people at a birthday celebration. It looks like they’re an extended family. The people at the head of the table are older and they look like the grandparents. The other people are all different ages, some are young children and there are teenagers and adults. A child is holding a cake with candles and everyone is looking at the grandmother, so it is probably her birthday. I love large family gatherings on holidays and festivals.I really get along well with my cousins so I enjoy any opportunity to get together with them. Also, it gives me a chance to spend time with my grandparents. What do you think the three friends are talking about? How do you think the girl sitting alone feels? How should the girl deal with this situation? 2 Answer the following questions. What experiences of bullying have you had? 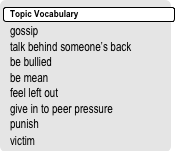 What kind of person is a bully? How can the use of social media make bullying worse? What can schools do to help deal with bullies? Do you think bullying should be made a crime? Explain. In the picture, we can see four teenagers – they look like students in a classroom. One is a girl who is sitting alone at a desk. She looks like she’s doing schoolwork. The others – two boys and a girl – are sitting at another desk. They seem to be talking about the girl who’s alone. They look like they’re gossiping about her. The girl is probably feeling left out and she looks quite sad. The other three look like they’re enjoying themselves. It’s difficult to deal with this kind of situation. Sometimes it helps to ignore the bullies but if that doesn’t work, there are online forums to help or you might have to tell someone – a friend, a teacher or a parent. Remember that this exam aims at evaluating the use of the studied grammar and vocabulary. Future Simple "will", "be going to"